(Nanowerk News) A team of researchers at the U.S. Department of Energy’s (DOE’s) Argonne National Laboratory is using nanomaterials to improve the energy efficiency of existing single-pane windows in commercial and residential buildings. The team was recently awarded a $3.1 million grant from DOE’s Advanced Research Projects Agency-Energy (ARPA-E) to develop a technology that could help achieve that goal. The nanofoam the team is developing – known as a nanocellular composite with super thermal insulation and soundproofing – uses gas bubbles less than 100 nanometers in diameter to block the transfer of heat and sound through glass windows while allowing visible light to pass through and maintain a clarity similar to normal windows. 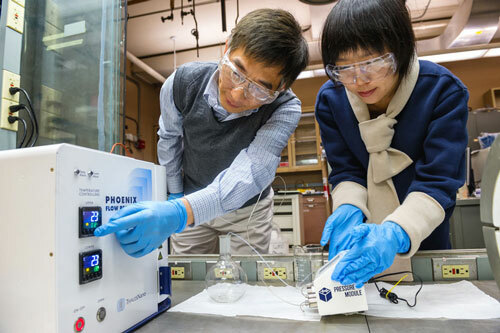 Principal chemical engineer Jie Li, left, and postdoctoral researcher Alina Yan create coated nanoparticles in a continuous flow reactor. Nanoparticles are key to an ongoing effort at Argonne to create more efficient window films.